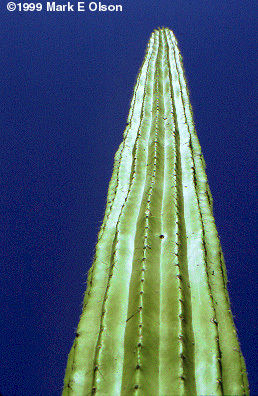 The Cactus Family is almost entirely restricted to the Americas. Though often associated with deserts, cacti are actually most diverse and abundant in dry parts of the tropics. The strange forms of cacti are among the most striking elements of dry tropical habitats in the Americas. So far, all of the photos here are from Mexico, but cacti are also very important in the rest of the American tropics. Click on a thumbnail for a larger image. 1. 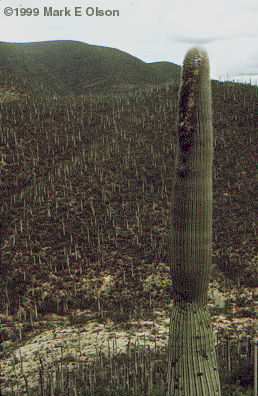 Cephalocereus columna-trajani in the Tehuacan Valley in southern Puebla, Mexico. This strange white cactus usually has only one stem for its whole life. Legions of C. columna-trajani covering hillsides is one of the strangest sights I've ever seen. The grayish swatch on one side of the stem near the tip is a mass of hairs from which the flowers emerge. 2. 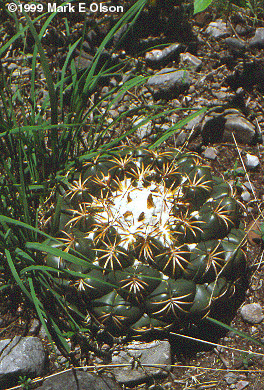 It's easy to mistake this Ariocarpus trigonus in Tamaulipas, Mexico, for a member of the Agave or Pineapple family. 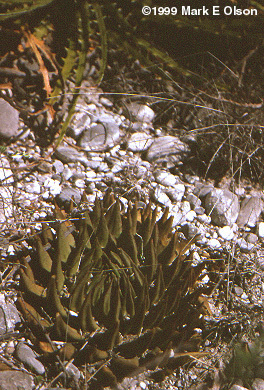 Most of the plant body of this plant is hiding underground. 3. A large Coryphantha sp. 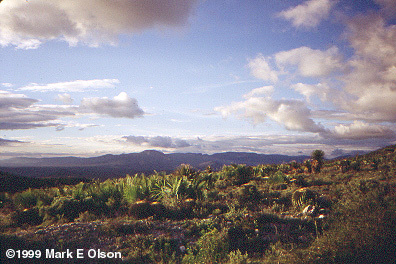 in tropical dry forest of Guerrero, Mexico. 4. 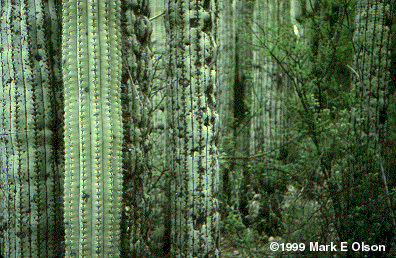 The columnar Neobuxbaumia tetetzo of Puebla and Oaxaca, Mexico, can form extremely dense stands that are hard to squeeze through. 5. Echinocactus platyacanthus growing with small palms (Brahea?) in northern Oaxaca, Mexico. 6. The wild architecture of Escontria chiotilla in Puebla, Mexico. 7. 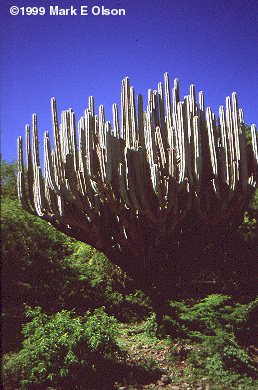 Another unbranched columnar cactus, Neobuxbaumia mezcalensis, in Guerrero, Mexico. 8. 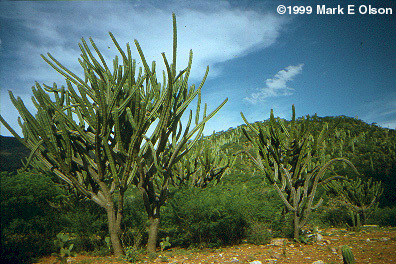 The massive candelabras of Pachycereus weberi are one of the most memorable images of Mexico's dry forests.